Some new images of the Google Pixel Slate tablet have appeared online, just ahead of the company’s hardware event that is taking place in New York City on October 9. The new device is expected to utilize Chrome OS and features a detachable keyboard and a stylus. The Slate will offer fresh competition for Apple’s iPads and Microsoft’s Surfaces. It appears the reports of the death of tablets are greatly exaggerated, considering Google is about to unveil a seemingly strong competitor to this particular market. 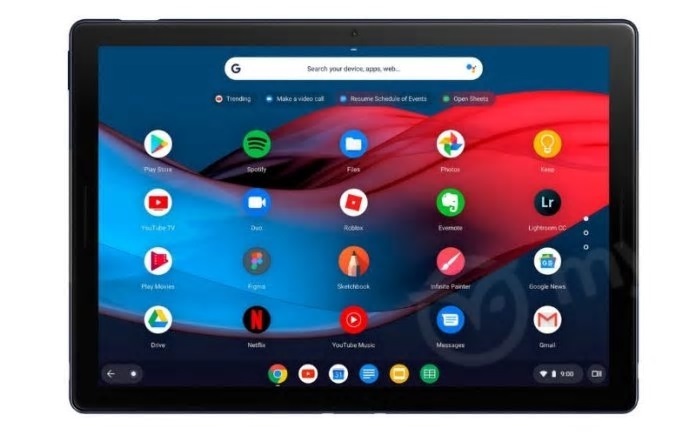 The Pixel Slate, which was known under the codename “Nocturne,” has been subject of numerous leaks – just like many other soon to be released Google devices. A handful of new images of the tablet have been acquired by MySmartPrice, which show the Slate with a detachable keyboard and active pen. Numerous details about the Google Pixel Slate have already been revealed to the world thanks to an appearance on Geekbench. The “Google nocturne” model offered specifications such as an Intel Core i7-8500Y processor, 16 GB RAM, and a display resolution of 3000x2000. Although the Geekbench entry specifies Android 9 “Pie” as the operating system, it has been stated that the tablet will utilize Chrome OS, whilst also being capable of installing and running Android apps. Aspects revealed by the new images (see below) include the detachable keyboard, which features circular keys and a touchpad, and also a nifty-looking stylus. The device is colored in dark blue, and it is adorned with a subtle Google “G” logo on the rear side. There appears to be both a front-facing and rear-facing camera, and there are dark lines on either side of the screen that seem to suggest stereo speakers are present. It has been speculated that the Slate will offer some form of cellular connectivity, but this has yet to be confirmed. A USB Type-C port and power button can also be seen. The actual specifications, possible variant details and prices for the Slate could be announced at the Made by Google event, which takes place on October 9 at Spring Studios in New York City.